Purchasing a bunk bed is probably one of the most exhilarating items one could acquire for a kid’s bedroom. With all the excitement of the child at the prospect of sleeping at the top and playing underneath one has to keep in mind certain safety measures. We would therefore like to draw your attention to some safety aspects of using a bunk bed. Most bunk beds will require assembly. It is always best to have more than one person helping during this stage. Be sure to follow the assembly instructions carefully. Ensure that all fittings are in place and kept tightened at all times as loose fittings may result in child injury or damage to the furniture. Be aware of small parts or extra fittings which could be swallowed by small children prior to assembly or plastic bags and other packaging that could suffocate or hurt small children. Do not attempt to move the furniture in an assembled state as structural damage may occur. Be sure to keep all fittings when moving as the same fittings may not be attainable at a later stage. Bunk beds are not intended for use in any other way than indicated on the product assembly instructions. Incorrect use, playing, climbing or jumping on furniture may result in damage to the components or injury to the child. Children must be at least 6 years old before they can use the top bunk. Children should always use the ladder/staircase when getting on or off the top bunk. Only 1 person should be on the top bunk at a time. Keep large toys or heavy objects off the top bunk. Never tie anything to the bed. Belts, cords, sashes, scarves or ropes can strangle a child. Use guardrails on both sides of the top bunk. The gaps in the guardrails should be 90mm or smaller to prevent strangulation. Guardrails need to extend at least 127mm above the mattress top to prevent kids from rolling off. Check that the mattress foundation is strong and that the right mattress size is used. Keep the top bunk at least 2m away from ceiling fans. Do not use the bunk bed or ladder if any parts are damaged or broken. Teach kids how to carefully climb the ladder. Keep bunk beds away from window blinds or curtains with cords. This is to avoid children becoming entangled and possibly strangled. Check regularly to make sure the bed frame is sturdy and free from signs of wear and tear. Put carpet under the bunk bed – research shows that carpet around bunk beds can decrease the risk of head injury from a fall. Keep the area under the bunk bed clear of furniture, toys and other sharp objects. Check for any gaps that may trap fingers, limbs and heads. Make sure there are no gaps of between 95-230mm anywhere on the bed. These could trap your child’s head. In other words, gaps should be smaller than 95mm so a child’s body can’t fit through or larger than 230mm so a child’s body can fit all the way through. Cuts are the most common injury, followed by bumps, bruises and broken bones. The head and neck are injured the most. 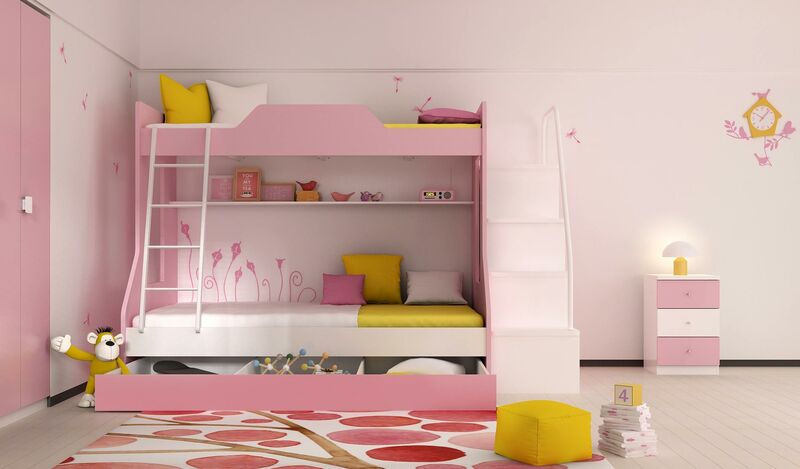 When you are choosing a bunk bed for your home, make sure it is sturdy and safe. Purchase a bunk bed that meets the latest safety standard. Check that the bed comes with instructions for assembly and use, and is undamaged (for example, make sure there are no cracks in welds on a metal bed). Make sure the top bunk has guardrails on all sides, even if the bed will be placed against a wall. You need a guardrail on the wall-side of a bunk bed, unless the bed is permanently attached to the wall (or built into it) or the wall is free of gaps, protrusions or other hazards. Make sure corner posts and ladders do not extend more than 5 millimeters above the guardrails or end panels. This is to reduce risk of clothes being caught. Make sure the ladder is securely attached to the bed and in good condition. Never remove it—for any reason! If replacement parts are needed, only use those from the original manufacturer. Never substitute parts from a different bed. Make sure your mattress is the correct size and thickness for your model of bunk bed. Check that the mattress fits snugly against all four sides of the bed. It should also be at least 127 millimeters below the top guardrails and end panels. With these important tips at your disposal you and your child will enjoy many years of peace of mind when it comes to living with a bunk bed. Next post: Behind the scenes of spanish brand Lorena Canals.